Dear friends, I have chosen to write and talk about one of the most interesting and yet mysterious subjects…. ‘Love and Suffering’. For myself, to come to a better understanding and appreciation of the role that …love and suffering…plays in my life, as a man, and in relation to my future career as a Hospital Chaplain, Lord willing. To encourage and challenge myself and others to walk in the footsteps of Jesus and in so doing, bring a bit of ‘Heaven’ here on earth and bring some souls to Jesus. May you walk with a loving heart always being kind. May you burn with zeal, and your purpose be to find. The lost, the broken-hearted and comfort all the sick. May you walk in God’s joy never blowing out your wick. May you walk in His gifts from His Spirit on High. May you lead others to their homeland in the sky. May you walk in goodness, may your fruit increase. May you walk in His Footsteps in the ways of Peace. …To Know…the patients and families and myself. …To Love…the patients and families and myself. And as a result of ‘Knowing and loving’…To Inspire these people to discover the ultimate purpose and meaning in life. From the three words… ‘To Know…To Love…and to Inspire’…I put my main focus on Love. I chose as my guide and barometer ‘1 Corinthians 13:4-7’…known as the Bible chapter on Love. On many of my hospital visits I have been confronted with that never ending, mysterious question… “Why do we suffer?” I will attempt in this short article to share with you my views on “Why do we suffer?” by speaking about ‘Love and Suffering’. Where…. ‘Love’ ….For Each Of Us Began. “The Father tells Saint Catherine in the Dialogue: I who am invisible made myself, as it were, visible by giving you the Word, My Son, veiled in your humanity. He showed Me to you. If we read the Creation story in the Book of Genesis, in the Bible, we discover that God…out of Love for us, created the earth, and then created Adam and Eve. God, out of love for us, in order to erase evil effects and the penalty of sin of Adam and Eve sent His only Son, Jesus Christ to be crucified and suffer like no one else has ever suffered. Out of love for each of us Jesus accepted to suffer the Passion and the Crucifixion. Then to go one step further, Mary, the Virgin Mother of God, accepted to be the chosen Mother of Jesus, our Saviour and then She suffered like no mother ever suffered, as she stood by watching her only Son suffer ‘the Passion’. Mary accepted her role, out of Love for you and me. Because Mary loved God, and loved us, she said “Yes” to God and she has suffered much. To go a step further, when parents decide to have children, out of love for God and one another, they too, in turn, will experience many sufferings while raising those children. I say all this to say…. Imagine living in a world where there is no love, no compassion. In this world someone who is suffering calls out for help, for love and no help comes forward, because it is a selfish world, where everyone lives for only… ”me, myself and I”. This would be a type of ‘Hell on earth’. “I am very lonely, will you spend some time with me? “Love dominates suffering”…is what a young patient told me recently. On one of my visits I encountered a young lady (40) Susan, (fictitious name) who had a breast removed because of cancer. Then, three weeks ago Susan was in a very bad car accident which caused her several head concussions, broken ribs, punctured lung and a broken left arm. Last week, at the hospital, in the cafeteria, I understood so well how ‘Love dominates suffering’. I will share with you the story of Robert (pseudo name) and his wife Jane (pseudo name). Over lunch together Robert shared this with me. He and his wife were married and had five beautiful children. The first ten years of marriage were normal with Robert travelling all over the world as an aircraft mechanic and Jane looking after the children at home. It was a very happy marriage, each one having a deep love for one another. Suddenly Jane discovered she had ‘schizophrenia’. She went through many electric shock treatments, long stays in mental institutions and many hours spent with psychiatrists. Robert told me his wife could get quite violent, waking him during the night as he would suddenly be assaulted by Jane. There came a time, the burden on Robert was so heavy, he had to place the children in custody for a time, so he could have the strength to cope with his wife. Years later, Jane developed ‘cystic fibrosis’, a disease which affects all the muscles of the body. It was then that Robert gave up his job, which he enjoyed so much, in order to give proper care to his wife. He did this out of love for his wife, Jane. Five times Jane tried to take her life. Once by drowning, another time by swallowing a poisonous drink, and again by trying to slash her wrists. Just imagine all the suffering Robert and Jane went through. Jane one day asked a psychiatrist to make up papers that she would sign that would make Robert free to leave her and remarry. That was the pure and unselfish love that Jane had for Robert. After telling me all this, Robert again asked me, “Why is there all this suffering in our life, it was bad enough Jane had schizophrenia, she didn’t need to get cystic fibrosis? I asked Robert what he thought. He had no answers. Earlier on I had asked Robert where he got his strength to manage to stay with his wife in spite of all the hardships and sufferings he had to endure. He was not sure. He said he was not a very spiritual person and that he was not a churchgoer. Out… “Love, Love…help me…I need you.” The other important thing I believe Robert realized was that he was much closer to God than he realized. When we decide to follow in the ‘Footsteps of Jesus’ we begin to reach beyond our own selfish confines and to love someone other than our self. We lay down our selfish desires, our lives, for love of others. In my own little way, I have been trying to be God’s vessel of love to the patients, their family, and some of the professionals I visit with at the hospital. While travelling on the bus from University to the hospital (one hour drive minimum) I make it part of my goals to pray for everyone I will meet that day and that I may be God’s vessel of love unto them. I thank God the Father for His unselfish love for each of us through His only Son, Jesus Christ.. The broken-hearted and comfort all the sick. May you walk in His Footsteps. By being conscious of wanting…to know…to love…and to inspire…. 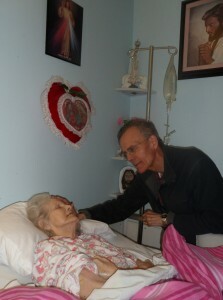 The patients and their families towards a personal encounter with Jesus Christ, it has deeply influenced my lifestyle. I have deepened my prayer life and have asked my friends to pray for me in my ministry as a Chaplain. I have greatly changed and improved my listening skills, being much less on the defensive and less judgemental with others. I am beginning more and more, like Mother Teresa, to see ‘Christ’ in the sick. I find myself standing on ‘Holy Ground’ as I meet with and minister to the patients and their families. I am convinced that in one way or the other, verbally or silently, I bring God’s Love to the ‘suffering ones’ and that my friends is the true calling, the true mission of every Hospital Chaplain and everyone who, as a ‘Good Samaritan’ visits the sick, to give them a ‘needle of Love’ and alleviate their suffering.